Lebanon's history dates back to Noah - the first winemaker mentioned in the Bible - and the winemaking tradition has defied many conflicts over the centuries. One day not so long ago, I was driving from Damascus in Syria to Beirut. After the border, the road winds down the Anti-Lebanon mountains. Ahead is the Bekaa Valley, laid out down below like a giant's play-mat. On that morning, the road through the Bekaa was jammed. The Lebanese army was rounding up some suspects and had put up a roadblock. Dozens of soldiers with automatic weapons were outside a building and on the roofs opposite, while some of their colleagues pulled bearded, handcuffed men towards an army lorry. The mood in the traffic jam was philosophical. Military roadblocks and checkpoints are part of the scenery in Lebanon. So are contrasts that the Lebanese accept but which might surprise some foreigners. About 20 minutes later, I turned off the main road - a little dusty, chaotic and definitely Middle Eastern - into a gorgeous patch of land that would not have looked out of place in Provence. It was the Massaya, one of Lebanon's most dynamic and successful wineries. Borders of lavender fringed the lines of vines and white doves puffed out their chests on the porches of big wooden dovecots. It could have been the south of France, but wine production - and the leisurely enjoyment of it - is deeply rooted in Lebanon. The muezzin called the faithful to prayer from a local mosque as I sat down with Sami and Ramzi Ghosn, the brothers who own Massaya. We sampled their excellent reds and whites - and a marvellous arak - and ate a lunch grilled on a fire of off-cuts from their vines. Ramzi and Sami are Christians, like almost all Lebanese winemakers. There are Christians throughout the Middle East, often living difficult, embattled lives. Lebanon's Christian community has been weakened by emigration and is no longer dominant but it is still a large chunk of the population and politically powerful. That is a major reason why wine production thrives in Lebanon in a way that it does not elsewhere in the Middle East. Ironically, given their troubled history, Lebanon's only vinous rival in the region is Israel. The Ghosn brothers explained how wine fits into Lebanon's sometimes difficult cultural mosaic. Very many Lebanese Muslims - Sunni and Shia - stay well away from wine. But not all do, and Sami and Ramzi said that Lebanese from all the country's religious groups had been at their table, and Shia Muslims from a local village worked on their property. The Bekaa is a stronghold of Hezbollah, the Shia political, social and military organisation. With its Iranian allies and patrons, it is an arch-enemy of Israel. Inside Lebanon, it is a dominant force. Later Ramzi Ghosn, choosing his words very carefully, explained their relationship with their Hezbollah neighbours. "Honestly they have been very tolerant, open-minded about it. They know perfectly well that you're here. We carry on with our business and they don't mingle with our business, we don't mingle with their business. "And I'm sure that some of our employees are sympathisers to Hezbollah. I'm sure. I don't agree with that, it's not part of my culture, it's not part of my way of living but they are open-minded and they carry on." The prospect of internal conflict is never very far away in Lebanon. Foreign powers sometimes fight their battles by making proxies of Lebanon's factions. The memory of the brutal civil war of the 70s and 80s does not stop many Lebanese speculating at length about the chances of one happening again. From day to day though, the Lebanese are forced to live alongside each other, tolerating each other's customs. The price for challenging the status quo can be very high. And in a country as unstable as Lebanon, with a powerful Israeli neighbour to the south, perhaps they have bigger things to worry about than the social customs of different communities. You can see how it works in Beirut. The southern suburbs are controlled by Hezbollah. The people here are, in the main, pious and socially conservative. Most women wear Islamic styles of clothing and the only cocktails you can get are made of freshly squeezed fruit juice. Yet a few miles away, in the centre of the city and out to the east, there are restaurants where you can drink fine wine and nightclubs where you can drink everything else, where exuberant female customers dance on the tables. Compared with the world's wine superpowers, Lebanon's wine production is tiny but its history goes back to the Phoenician civilisation in the ancient world. In Baalbek, in the Bekaa Valley, the Romans left a temple to Bacchus, the god of wine, which still stands. The modern Lebanese wine industry dates itself from 1857, when Jesuit monks at Ksara in the Bekaa began importing vines from Algeria. After World War I, when the French took control of Lebanon, its vineyards expanded to satisfy France's thirsty imperial troops. These days, Lebanon has a range of wine producers, from well established businesses like Ksara, Kefraya and Musar, to small boutique producers. In the hills east of Beirut, Naji Boutros - who used to be an investment banker in London - and his wife Jill started Chateau Belle-Vue in Bhamdoun, the village where he grew up. They are hoping that producing wine will revive and strengthen the local community. To grow grapes, they have revived terraced vineyards - and old skills - that had fallen out of use. They also finance community projects, including a library, and they are cultivating land that otherwise would be covered with a few more of the lavish villas that sprout all over the mountains outside Beirut. Eight years after their first vintage, they produce a really substantial Bordeaux-style red. Lebanon is the Middle East in miniature, a microcosm of a troubled part of the world with all its surprises, strengths and weaknesses. The outlook is not clear, and I have never found anyone in the region who thinks the future will be easy. But winemaking is the pursuit of a lifetime. Progress is counted by the annual vintage, and the best wines mature over decades, not years. 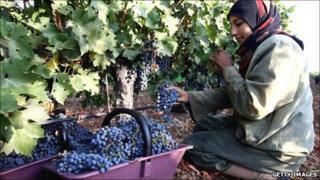 Lebanon's wine industry has survived invasions and wars over centuries. Like the country itself, it has found a way to roll with the punches and carry on. Vines On The Frontline was broadcast on Wednesday 12 January at 1100 GMT on BBC Radio 4. It will also be available on the BBC iPlayer .